Waterloo is a neighbourhood with working-class roots that’s undergone some big changes. We understand where this neighbourhood is coming from and where it wants to go! Here are a few of the reasons why Randwick Electrical is a good choice of electrician in Waterloo. 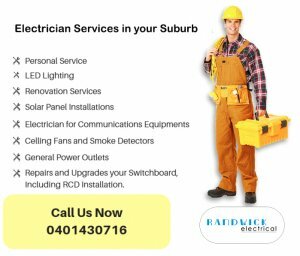 Our skilled team of local Sydney Electricians at Randwick Electrical is small enough for you to get a personal, reliable service, and at a good price. When you call Randwick Electrical, you can expect gold class service. That means we treat every client with the same respect and attention. If you’re a busy, working parent who needs a small repair, we’ll treat you the same as a developer with a massive project. We welcome everybody’s business, and we strive to be your go-to electrician in Waterloo. Ever seen the movie “Brazil” by Terry Gilliam? When Robert De Niro’s character opens the ducts in Sam’s apartment, he spills shoddy wiring everywhere! In the movie it’s hilarious, but if one of our electricians saw that job they’d be ashamed! In real life, messy electricians are a hazard. So, hire Randwick for your electrical needs and rest assured that the job will be tidy from start to finish. DeNiro’s character got there in the end—but Randwick Electricians get there from the start. Remember, we’re all in this together!